Ecommerce has made it possible for the etailers to dream big and build a brand presence in the global market. However, to turn this dream into reality, they need reliable and secure payments gateways that operate in multiple countries and accept multi-currency payments. In our previous blog we presented the payment gateway list of the top 5 Indian payment system. Now, we bring for you a list of best 5 international gateways than can help you expand your business and take your brand to global markets. We have taken care to pick the payment channels that offer the easiest and low cost or free set up and offer wide coverage in terms of geography and currencies. Paypal is one of the oldest and most popular payment gateways for online businesses. 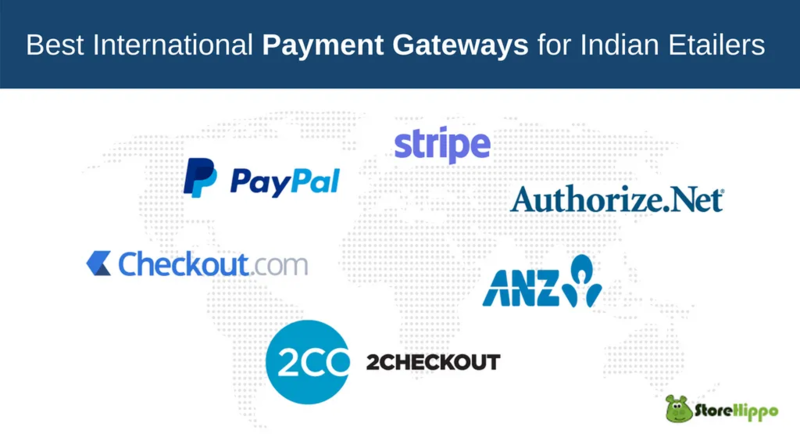 We have chosen it to begin our international payment gateway list as everyone has heard about it and can easily connect to Paypal as an international payment system. Paypal has the largest number of active users and setting up a Paypal account is very easy. They have no set up fees and the structure for successful transaction charges is also very transparent. It is based on the volume of monthly transactions and merchants can claim discounts once they cross a certain monthly threshold. Paypal is available in almost all the major countries of the world. It integrates with an unbelievable number of shopping carts hence can be used by any business/ platform. Apart from regular payment transfers to Paypal account it also allows to accept link payments by sending links to your customers. Paypal can be accessed through web page as well as mobile and iOS apps making it a good choice for omnichannel business. 2CO is one of the most popular online payment systems based in USA. It has no set up fees or monthly fees making it a good option during the start of the business.The rates are based on the home country and tied to each successful transaction. Customers who process large volume of data can get specific custom discounts. Stripe is one of the top contenders in the payment gateway list with ZERO setup cost , monthly fees or any other hidden charges. It works on the pay as you go model and is good for business who are starting small but plan to scale up in near future. Stripe is very easy to integrate and offers plenty of tools that make it work with almost any type of cart or platform. The flexibility of Stripe platform makes it an ideal candidate for customised payment needs as per the business requirements. Stripe is ideal for Ecommerce industry as it supports simple checkout for debit and credit card processing. They also offer mobile app integration and recurrent billing support. Stripe has multi-currency support and also offers custom coupons for discounts. It accepts payments in all the major currencies of the world and also supports ACH and Bitcoin payment processing. Authorize.net is one of the oldest and the best online payment systems for small merchants and it promotes itself as a “small business payment solution”. They have different fee structure based on the 2 plans, i.e; gateway-only plan and a gateway + merchant account plan. They do charge setup and monthly fee and also have charges per transactions. It can be used for doing business in United States, Canada, United Kingdom, Europe, and Australia.Authorize.net has a strong a simple checkout and support for recurrent billings. It also supports eCheck processing and has a strong fraud protection mechanism to safeguard the interests of the merchants. Startup plan, Business Select Plan or Community select Packages( designed for community and nonprofit groups). They offer payment gateway as well as merchant account services. The startup package has waived monthly fees for first 12 months and allows unlimited transactions. The Business select plan has uniform fee at $32+GST per month. For the community plan they offer customised deals and have waived off establishment fee, monthly fee, annual fee etc. ANZ offers options for easy and secure web and mobile payments making it a much sought after payment gateway by Indian merchants planning to take their business to global markets. Checkout has made to Storehippo recommended international payment gateway list due to its various merits. To begin with it allows hassle free setup, quick processing and multiple payment options for global as well as domestic transactions. Based on transaction volume, history and card type they offer two plans, namely Enterprise and Standard. They offer options for easy online and mobile payments, various Ecommerce plugins debit card and netbanking support apart from regular credit card processing. They also offer recurrent billing which makes it simpler for customers as well as merchants to process repeat orders. It is always better to go through the complete payment gateway list and make an informed decision about the payment processor most suited for your business. StoreHippo offers quick and easy pre-integration with all the above payment gateways needed for an international ecommerce business. To see the complete list of payment processors you can check the StoreHippo Payment Gateway page. Keep visiting our blog section as we are going to bring the unique advantages of Storehippo Payment Gateway integration in our coming posts.